Have you ever been defined as the problem? You know that feeling when someone says it’s because of the place you lived, the color of your skin, your socio-economic class or earning potential, how long you’ve been with the organization, the school, in your community, or even what gender you are or who you love, that determines the access to opportunities you have. I don’t know about you, but I’m tired of being defined by limits, identified by a characterization, and placed on the outside. Who am I you might be asking? I am a military spouse, a military family member, or even to some in federal circles, a dependant. Clearly I see myself and other military families differently. I see a career professional, social change agent, advocate, parent, friend, supporter of all things Star Wars and Star Trek, patriot, lover of laughter, ice cream, and animal videos on YouTube and ice hockey. What really gets me is when someone defines me as a military spouse or family member implying the underlying stereotypes that come with it and then limits my opportunities for potential growth and achievement. After all, I see myself and others as an asset, not a liability. I don’t see family members as problems as much as I believe we are limited by our environment. We have become socially disadvantaged and marginalized. The total active, Reserve and National Guard force equals around 2 million service members. 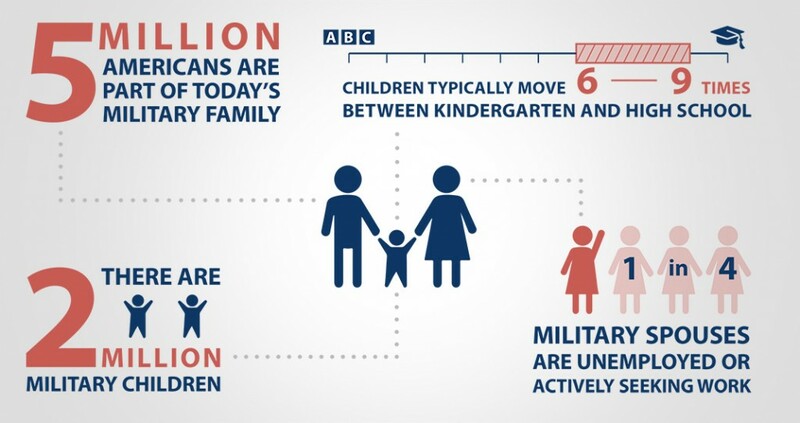 53% of the active duty force and 48% of National Guard and Reserve are married; 43% of all service members have children. America’s leadership recognizes with service members come families. As a matter of fact, military research shows that the family (spouse, children, parents, siblings) is the single most influential source impacting enlistment and reenlistment. So then why are there only temporary fixes to the problems created by a military lifestyle? Where is the buy-in missing? 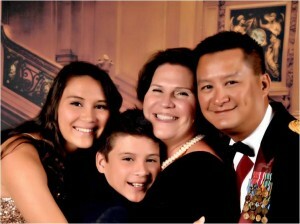 For me, all military family members have identified strengths, talents, and abilities. They are simply confronted with barriers that they must realistically assess to match their personal situation in hope of achieving opportunities. Too many times to count, I have been stopped in my tracks by local, state or federal rules or citizens who are biased against the diversity of military family structures and our mobility. Local communities need to see our potential as a proud, serving, and dedicated family. Know that my nomadic children and I desire the same opportunities to succeed and fail as each of you who have had your roots firmly planted. I have interviewed for a job, only to be questioned on my consistently inconsistent employment history. I fight to be under-employed, to establish a career, to even volunteer. Corporations, businesses, and organizations need to see my potential and invest in me. Know I am just as dedicated to my career as to my military lifestyle and the nation! To honor military families, Congress designated the first Military Family Appreciation month in November 1999, and since then every US President has signed a November proclamation declaring a month long celebration honoring the commitment and sacrifices made by the families of the nation’s service members. That’s nice. Is it a coincidence that November was chosen for the month long observance? Our nation already has significant November holidays that celebrate sacrifice and service to our nation (Veterans Day) and a celebration of family, gratitude, and gifts bestowed upon each of us (Thanksgiving). As a 20+ year military spouse, I appreciate the symbolic gesture. I mean who wouldn’t want to say they support and stand behind family members whose loved ones work 24/7 in service of our nation, sometimes far from home during key family life moments. Who wouldn’t want to acknowledge their support of a military spouse and military children who move every two to three years. And in doing so, indirectly recognize that military mobility can contribute to a postponement or even forfeiture of the family member’s own careers and goals. Who wouldn’t want to give a thumbs up and a pat on the back to a military child that just found out they will move to their fourth or fifth school. And while they were talented in sports, music or some club activity at the other school, it comes down to the new coach or the faculty instructor not really knowing them. So they sit and wait, hoping for a big break just so they can belong. American society should know that my family and I, after a decade and half of constant deployment, are no different than any other American family that has faced piling on challenge after challenge. We are strong and resilient; and that carries over to whatever neighborhood, school, community, or job we find ourselves. I also understand the ambiguity behind such a hollow proclamation; the applause for simply being there, for giving something up. Like I said, I have lived that “tag-along” lifestyle now for 20+ years, where my service and sacrifice is notable because of what I have given up – not for what I have achieved. You’ll quickly understand that the paradox is that they never really find home because of the sacrifices those Presidential proclamations extol – that make their lifestyle and childhood tough. For the short version, look for a YouTube video called “It’s Not About the Nail.” Many times, the strengths that I have, that many other family members have, are negated, marginalized, or self-silenced because the focus is on the circumstances. Lastly, the lifestyle creates barriers for transition into local communities where both bias and judgment exists. How can a family be expected to successfully integrate into communities, build ties, thrive and breakdown barriers, only to move 2-3 years later. So how do we as a society stop defining people by their problems? I don’t even want to propose the philosophy of some who claim they “don’t see race, or status, or gender. Everybody is equal.” Honestly, that is baloney. Everyone has unconscious bias, there exists structural barriers in society, and our personal context does matter. What’s needed is an inclusive approach where we define each person on their own merits and strengths, as well as learn to constructively appreciate the differences we all have. I’m not saying, with regards to military families, that the federal government or the local citizenry is off the hook. Or that each family member must pull themselves up by their own “bootstraps.” No, we all have a vested interest in success. I believe judgment with bias must end in order for any person, not just a military family member, to be defined by what they bring to table and not how much of a headache it is to simply invite them. America needs to finally create a society where all people have dignity, honor, and humanity. That begins with each one of us. If the proclamation has not already been released, there will be one to declare November as National Military Family Appreciation Month. 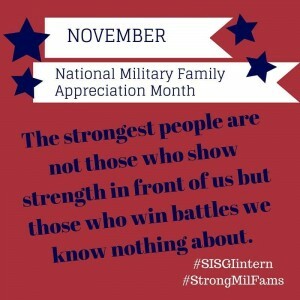 When you see or hear the beautifully eloquent words by the President honoring the families of all who have served our nation, I hope each citizen of the United States remembers this important saying, “The strongest people are not those who show strength in front of us, but those who win battles we know nothing about.” I am a military family member. See me as an asset to your community, as an asset to the nation, and as one more quality of diversity that adds beauty to the tapestry of America. Katy Hussey-Sloniker is currently working on a Masters in Social Work from the University of Southern California concentrating on community organization, planning and administration. She brings a wealth of knowledge to SISGI Group from over 18 years experience in program management and development with grassroots military social service, veteran service and federal agencies. She is passionate about program evaluation that ensures outcomes and impacts are on target, military and veteran families, and social justice for vulnerable populations. Katy currently holds a Bachelors degree in Political Science with a minor in German, a Masters degree in Business Administration. She has global work experience in South Korea, Germany, and Puerto Rico.